If you have bought iPod Touch 4G when it was delivered, you may be using the old version of iOS. Just connect your iPod Touch 4G to your computer to follow the onscreen instructions in iTunes to download the free update. However, when you try to put and play the video collections on Mac computer to iPod Touch 4G, you may face the problem that the videos could not be synced. While googling iPod Touch 4G video converter on Mac, Aunsoft Video Converter for Mac is the recommended fast conversion software for putting most videos that you could play with VLC media player on Mac to iPod Touch 4G movie format. For HD videos, you can enjoy 720p output as well. 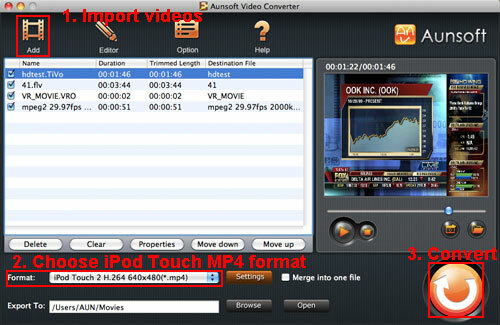 Follow the step-by-step guide below to convert TiVo/MKV/AVI/VOB/FLV to iPod Touch 4G with the latest iOS 4.2. Step 1. Load movies to Aunsoft Video Converter for Mac. Run Aunsoft Video Converter for Mac as the perfect TiVo/MKV/VOB/FLV to iPod Touch 4G converter on Mac OS X like Snow Leopard, Leopard, Tiger. Click the "Add" button to browse the videos for conversion. While importing TiVo videos, you should click the "Option" button and enter the Media Access Key (MAK) for the TiVo video, then click the "Add" button to import .tivo videos. The supported formats include but not limited to .tivo, .vro, .flv, .ts, .vob, .mkv, .mpg, .dts, .ac3, .ogg, etc. Step 2. Choose iPod Touch MP4 output format. Click the "Format" option, and choose iPod > iPod Touch 2 H.264 640x480(*.mp4) as output format. 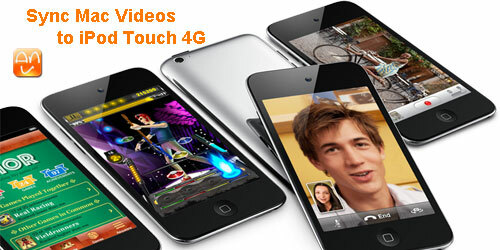 As iPod Touch 4G supports 720p video playback, just click the Settings button and change the video size by typing 1208*720 for output video. Step 3. Convert TiVo/MKV/AVI/VOB to iPod Touch 4G MP4. Click the convert button under the preview window, and the video to iPod Touch 4G converter will start converting Mac movies and videos from FLV to iPod Touch 4G MP4, TiVo to iPod Touch 4G MP4, MKV to iPod Touch 4G MP4, VOB to iPod Touch 4G MP4, and AVI to iPod Touch 4G MP4. After the conversion, just put and play the videos to iPod Touch 4G with iOS 4.2 to enjoy the HD videos like MKV, TiVo, AVI and so on. If your DVD movies are encrypted, or you want to play Blu-ray disk movies on iPod Touch 4G, you would try Aunsoft iMedia Converter for Mac as the all-in-one iPod Touch 4G converter. The converter also includes output profiles for iPhone 4, iPhone 3GS, and iPad.